WOOHOO! I’m growing something new in my garden. Okay, so I have to be excited about anything growing out there this year. I bought 6 snow pea starts at the Extension Service Master Gardener’s sale this year and we finally got something off of them. It’s not much, granted, and it may be boring for some people, but this is a first for me to grow them. I have to say that I like them. I like them so much that I may just have to grow some more next year. In a rough gardening year, you have to celebrate every victory! Yee Haw! I also recommend sugar snap peas, MMMMM. YUMMMM!!! You have gotten more peas than I have! I planted sugar snap peas from seeds, but so far I only got 1 peapod! Something has been eating them – first it was just the peas that were eaten, now it’s the entire plant that’s being eaten. I keep requesting that Randy put up a better fence around the garden, but so far that’s not very high in his priority list. So your peas are doing better than mine this year! Always celebrate the small things! I’m always excited by the first time doing things. What fun to relive it through others! We love, love, love those things too. We blanch and freeze them, and eat them the entire year. Nothing beats thawing a pack of summer garden in the dead of winter! Snow peas are delicious! I love them raw in salads and cooked up in stirfries. Good for you!!! I just saw King Corn. Starting your own farm sounds like an even better idea now. 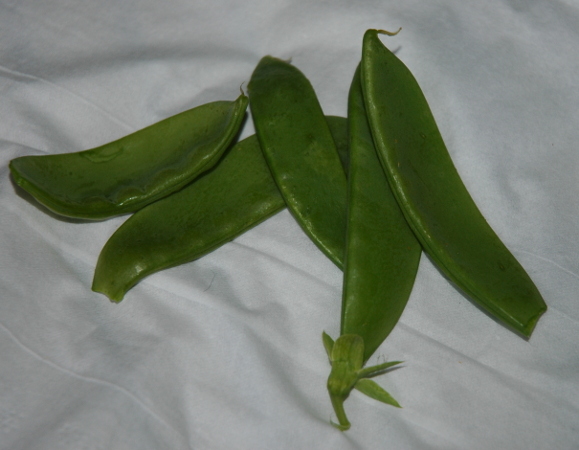 If you have lots of extra snow peas this year, maybe you can use the surplus to make high fructose snow pea syrup. Ali – Yes, we will definitely be planting more next year! I didn’t realize what I was missing when everybody else here was planting them in February. Lynn – That’s too bad about your peas. I can imagine a deer would be very happy to munch the whole plant. We’ve been seeing a lot of deer lately, but none in the garden yet. Our peas look positively anemic when compared to the wall of them my mother-in-law has. She’s even raising a variety that has ridiculously curly edible dendrils. They look like lace. Ron – I’m afraid we don’t have nearly enough to save. Maybe next year! Benita – Yes, we sometimes get them at the store for salads, but they homegrown ones taste fresher. Rachael – Ha ha! I don’t think the government is going to subsidize my high fructose snow pea syrup though, so I’m doomed to failure before I begin!